To see if your community offers a One Happy Camper program, see our list of partners below and contact your local program provider. Eligibility criteria varies from community to community. 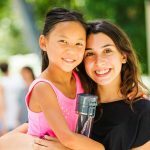 Typically, campers must reside within the local program provider area, already be enrolled in their first overnight nonprofit Jewish summer camp (a 12-18 or 19+ consecutive day session), and identify as Jewish. One Happy Camper was envisioned as an outreach initiative for children who are not currently receiving an immersive, daily Jewish experience. As such, children who attend Jewish day school or Yeshiva are not typically eligible these programs (however, some exceptions apply). Please note that although located in North America, children residing in Mexico are not currently eligible to receive One Happy Camper grants at this time. One Happy Camper is not a scholarship program. Grants are not based on financial need. A child can only receive one grant that is affiliated with the Foundation for Jewish Camp’s One Happy Camper program. This includes, but is not limited to, the PJ (Library) Goes to Camp – One Happy Camper program, the Harold Grinspoon Western Massachusetts camp incentive program, and/or the various community-based and camp-sponsored One Happy Camper programs. If you do not live in a One Happy Camper community and are not eligible for the PJ Library One Happy Camper grant, your camper may be eligible for a One Happy Camper incentive grant through your camp. Visit the ‘Contact us‘ page to see if your camp offers One Happy Camper grants. Campers with Special Needs enrolled in Jewish Day School are eligible to for grants. *Campers who previously attended camp for 11 days or less are still eligible for first-time camper grants. *Campers who qualify for the special needs grant with previous camp experience are eligible for first-time camper grants. What is your definition of special needs? The Jewish Federation of Greater Los Angeles is offering incentives to Los Angeles Jewish teens and young adults with specials needs for summer 2019. The Jewish Federation of Greater Los Angeles defines special needs as intellectual or developmental disabilities and physical impairments, such as autism spectrum disorder/Asperger’s, blindness, Down syndrome, hearing impairments, and seizures. This definition includes ADHD campers only if the camper requires extra staff support or accommodations to be successful at camp. This does not include campers with ADHD if the camper requires little or no accommodation and/or solely because the camper receives medications. $1000 grants for campers who are the first in their family to attend camp and are enrolled for 19+ consecutive days. $700 grants for campers who are the first in their family to attend camp and are enrolled for 12-18 consecutive days. $500 grants for campers who have siblings that attended camp and are enrolled for 12+ consecutive days. Campers are only eligible if s/he is attending Agudah, B’nai Brith Manitoba, B’nai Brith Ottawa, Gan Israel Toronto, Camp Kadimah, Camp Kinneret Biluim, Camp Massad (Montreal), Camp Moshava Enismore, Camp Northland B’nai Brith, Camp Ramah Canada, Camp Shalom, Camp Shomria Canada, Camp Soleilim, Habonim Dror Camp Gesher, or URJ Camp George. If your child has previously attended Jewish overnight camp for a 12-18 day session and has not received the OHC grant, he/she is eligible for the grant this year. The amount of the grant will depend on the length of the session he/she is enrolled in for Summer 2019. Campers who previously attended camp for 1-11 days or less are still eligible for first-time camper grants. *Campers who previously attended camp for 10 days or less are still eligible for first-time camper grants. *Campers who previously attended camp for 18 days or less are still eligible for first-time camper grants. *Only campers who have never attended camp for any period of time are eligible for first-time camper grants. Provides grants to families residing in the greater Rochester, NY area. Campers must be entering grades 2-12 (after camp). If camper previously attended camp for less than 12 days, s/he is still eligible. For summer of 2019 only: if the camper attended camp for 12-18 days in previous summers and are attending for 12 or more days in 2019 then they are eligible to receive a grant. The Jewish Federation of Greater Washington has a limited list of camps to whom they give grants. Please contact the Federation directly to learn if your camp is eligible. Campers are eligible if they are current PJ Library members, PJ Library alumni, or siblings of PJ Library members or alumni. Why don’t federations give grants to campers who attend Jewish Day School or Yeshiva? The One Happy Camper Program was envisioned as an outreach initiative for children who are not currently receiving an immersive, daily Jewish experience. As such, children who attend Jewish day school or Yeshiva are not eligible for these programs.